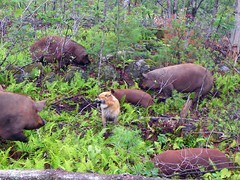 Our pigs are purebred Tamworth pigs, registered, and they live outdoors, year round. They always have shelter available. They use it in a sleet storm. If it’s only cold or snowing, they prefer to pile up next to the food trough to be ready for breakfast. We give them big round bales of hay which they move around to where they want it, and they both eat it and use it for bedding. It’s pretty impressive to watch them move it around. The primary feed for the pigs is what they forage in their paddock, hay, and then we give them the leftovers from the local food pantry/soup kitchen, the Community Kitchen in Keene. These are not plate scrapings, which would be, quite correctly, illegal. It’s things like carrot peelings or donations that exceed their ability to serve or give away: Once in 2011 they were given literally an 18 wheeler full of carrots. We got several tons (yes, tons) then, and the last 1000 lbs just this month because they were starting to sprout. There is a major organic yogurt company, also local, which donates whatever good product they have that cannot be sold, usually underfilled or mislabeled. It’s a big plant: One mess up can produce more yogurt than all the pantries in the tri-state area can give away before it expires. We do not give the pigs beef or pork, but do sometimes give them chicken. Beef or pork would also be illegal, for good reason. One of the reasons the Kitchen likes us is that we have six dogs, so that unlike other pig farmers we are happy to take the beef and pork off their hands. 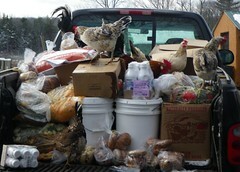 The dogs are as excited as the rest of the farm when the truck rolls in with a new haul. This food is not in general organic, although the yogurt is, but is all USDA/FDA approved for human consumption. 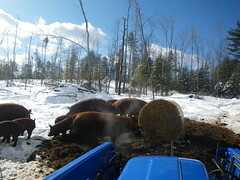 The pigs have roughly six acres of pasture, and forage extensively when the ground is not snow covered. (One day last October, I gave them carrots again. They literally turned around and walked into the woods to find something else.) The last farm on this land was in the 19th century, so whatever they find would qualify as organic, since we never use poisons, chemicals, or pesticides. After several years there are also many volunteer tomatoes and squash plants all over their paddock, which they harvest continually. Probably half of the food we provide for them is yogurt. However we do, if there is nothing else available, feed them commercial hog pellets, mostly in late winter or early spring. I believe we’ve bought 14 bags in the last twelve months. Given what’s in the “human” food we feed them, I feel it would be hypocritical to make a big deal of that tiny amount of organic feed, so as a yankee by adoption, I saved the fifty bucks and bought conventional grain. Nobody has asked about drugs, but I’ll answer anyway. I will use drugs to help a sick or injured animal, just as I will for myself or my family. I will not in a million years use antibiotics as growth enhancers. That’s just trying to prove that Darwin was right. For those who want no drugs at all in their meat, no worries. Pigs are spectacularly healthy critters and I have never medicated any of the current herd for anything. There’s been no need. On to pricing. This time we took the pigs to Adams Farm Slaughterhouse in Athol, Massachusetts. For a half pig we are charging $3.50/lb hanging weight. This is vacuum packed, USDA inspected. We absorb the kill and cut fees. Smoking and curing are $0.65/lb. That is the slaughterhouse fee, and we do not mark it up. The cut sheets are in, so all the ham is smoked and the shoulder is not. There is hot sausage, breakfast sausage and ground pork: I had to choose pig by pig, but I’m happy to mix and match as long as it comes out even. Note that these are very big pigs. The one we have left hung at 591 lbs. Hanging weight for a normal market size pig is around 180. A quarter is $4.00/lb, plus smoking and curing. Normally a quarter pig has problems with splitting up things like tenderloin and spareribs. These girls are big enough that half of each is still a nice meal. Note also, that wherever you go, the fatback is included in the hanging weight. Many people do not actually want it, but Lisa does, to render it into lard. If you don’t want yours, I’ll credit your bill pound for pound. We’ll have lard for sale again, soon.